South Africa 3-119 (Jacques Kallis 48*, Jean-Paul-Duminy 47*, Jade Dernbach) beat England 7-118 (Craig Kieswetter 25, Graeme Swann 18*, Johan Botha 2-19) by seven wickets. South Africa did not panic even after the initial setback as Jacques Kallis and Jean-Paul-Duminy achieved the nominal target set by England in the 1st T20. England managed 118 runs for the loss of seven wickets in the allocated 20 overs and South Africa smashed 119 runs after losing three mere wickets in 19 overs. Dale Steyn (South Africa) was declared ‘Player of the match’ for his economical bowling spell of 4-0-13-1. The first Twenty20 of the three match series was played on Saturday, September 8, 2012, at Riverside Ground, Chester-le-Street. Earlier, the South African captain, AB de Villiers, won the toss and opted to field first. England opened the innings with Craig Kieswetter and Alex Hales in an attacking mode as the latter hit two back to back boundaries in the very first over. Kieswetter punished Lonwabo Tsosobe for 14 runs in the third over with 1 six and a couple of fours. The openers scored 27 runs in 3.4 overs and were going well when Alex Hales was unluckily run out for 11 runs. Craig Kieswetter went back to the pavilion after the addition of 13 runs in the total at his personal score of 25 scored from 24 balls with 1 six and 3 fours. 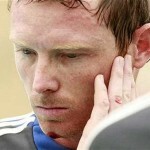 The Proteas bowlers took charge of the situation and the English batsmen found it hard to survive. They were struggling at 7-85 runs in 15.3 overs when their skipper, Stuart Broad and Graeme Swann got together in the park. The duo accelerated the run rate by negotiating the rival attack at merit. Swann was the most attacking of the two and dispatched three boundaries during his 13 balls stay at the wicket. Both batsmen remained unbeaten at 18 runs each as England scored 118 runs with three wickets in hand. Robin Petersen and Johan Botha were the most impressive bowlers with two wickets each whereas Dale Steyn and Albie Morkel claimed one wicket each. South Africa initiated the innings in a dismal way by losing their three top order batsmen for 29 mere runs in the first four overs. The fast bowling duo of Steven Finn and Jade Dernbach created difficulties for the rival batsmen and grabbed one and two wickets respectively. Richard Levi was gone for eight runs, Faf du Plessis scored four and AB de Villiers posted 10 runs on board. 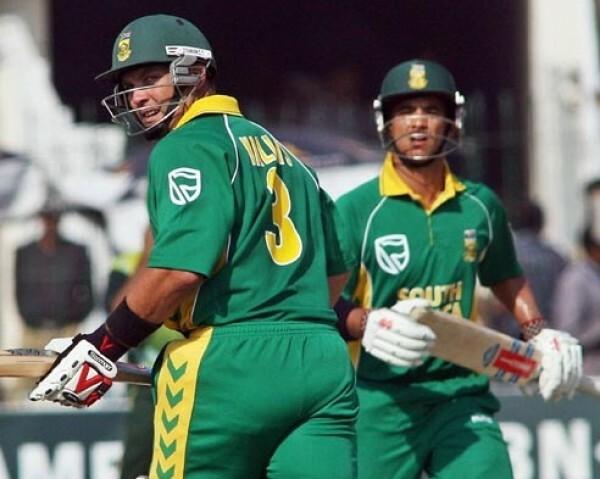 The most experienced batsman of South Africa, Jacques Kallis and Jean-Paul-Duminy faced the lethal bowling attack of the hosts in a brave manner. Kallis sent the ball rolling out of fence twice in the seventh over and the fifty of the innings also appeared on board. The batsmen kept on creeping as Duminy scored two consecutive fours in the 11th over. Stuart Broad deployed six bowlers to dislodge the commanding partnership but remained unsuccessful. 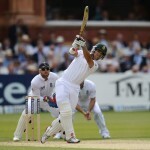 The hundred of the innings was reached in the 17th over and the batsmen sparkled with the boundaries regularly. The visitors required just four runs to win the match in the last 12 balls as Kallis got the winning run on the last ball of the 19th over. The Proteas thrashed 119 runs with seven wickets in hand and six balls to spare. Jacques Kallis remained unbeaten for 48 off 44 balls with 7 fours and Jean-Paul-Duminy held his end with 47 from 54 deliveries comprising 4 fours. South Africa won the first T20 with a big margin of seven wickets and leads the three match series 1-0. The second game of the series will be played on September 10, 2012, at Old Trafford, Manchester.